Smoke and heat exhaust ventilation systems, also known as "SHEVS" are natural or powered systems to remove smoke from a building allowing low level escape routes to be kept clear of smoke and reducing damage to the building. 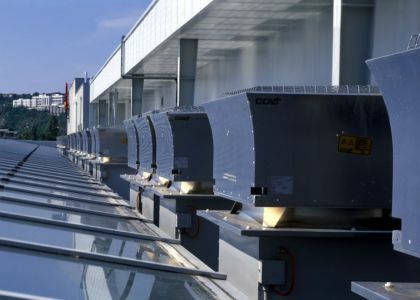 SHEVS comprise three main components: the exhaust ventilators, needed to remove the smoke; smoke barriers, needed to limit the spread of smoke while it remains in the building; and inlet ventilators, needed to allow fresh air in to replace the smoky air removed by the exhaust ventilators. Dampers and ductwork are often integrated into the scheme. A choice has to be made between natural or mechanical ventilation. Natural smoke ventilation uses the natural buoyancy of the hot gases to drive the smoke flow through the ventilators. Such systems often have a dual function and provide both smoke ventilation and day to day ventilation. By contrast powered smoke ventilation relies on mechanical extraction through fans. Where the roof space is extensive, it’s necessary to limit the spread of smoke within the roof space. This requires high level smoke barriers to divide the roof space into discrete smoke reservoirs. These barriers may be fixed or automatic smoke curtains or heat resistant boards or glazing. Barriers are also often used in complex buildings such as shopping centres and atrium buildings to control the flow of smoke into the mall or atrium. View our smoke containment page. The height of the clear layer below the smoke is critical. It needs to be high enough to protect property and escape routes and to ensure that fixed smoke barriers will not adversely affect building usage while being kept as low as possible to minimize the cost of the smoke control system. A supply of replacement air is essential. As smoke and gases are extracted, sufficient air needs to take their place. Otherwise the building will become depressurized and the smoke ventilation system will become ineffective. Air supply may be from natural ventilators in smoke reservoirs remote from the fire or from dedicated low level air inlet ventilators or automatic doors. Colt can assist with the design of smoke and heat exhaust ventilation schemes. Colt offers a free technical design service on all projects undertaken. Please contact Colt for further information.